The refined (by comparison) Suzuki GT550 poses with its much more berserk rival, Kawasaki’s H1 Mach III. 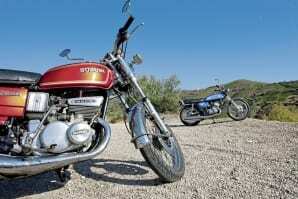 In recent discussion with one of this column’s readers, I was asked why on earth we hadn’t done a feature on probably the most overlooked Japanese classic of the 1970s – and the guy had a point, for how often do you read anything serious about Suzuki’s GT550? It’s generally one of those bikes that either gets overlooked or marginalised, and often for all the wrong reasons. It’s effectively eclipsed by its big brother, the GT750, and often perceived as a poor man’s version of it; or alternatively, simply because it isn’t a fire-breathing Kawasaki H1 Mach III, it’s somehow a lesser and significantly duller machine. Knowing that the bikes sold well enough back in the day is good reason to take up the cudgels and argue the case for the forgotten triple.